What Message Does Ref Rodriguez Send to the Children of Los Angeles? It has been nine months since the news broke that LAUSD Board Member Ref Rodriguez was being charged with participating in a conspiracy that hid the true source of almost $25,000 in campaign donations from the public. While his lawyer claimed that the accusations were “much ado about nothing”, the District Attorney’s office felt that they rose to the level of a “Felony Complaint”. Through the use of legal maneuverings, Rodriguez’ attorneys have successfully pushed back his court date. Meanwhile, Rodriguez continues to sit on the School Board representing constituents that he is alleged to have defrauded. A month after this indictment, Partnerships to Uplift Communities accused Rodriguez of transferring “more than $285,000 in public funds from the charter school network he co-founded to two businesses with which he had personal ties.” State investigators had previously found that this same charter school operator had previously “showed an alleged conflict of interest in the awarding of millions of dollars in food contracts” while Rodriguez served on its governing board and as treasurer of the group. Recently, Rodriguez was forced to recuse himself from a vote on extending the Inspector General Ken Bramlett’s contract since both of these matters were referred to this office. However, his three charter industry allies, Monica Garcia, Kelly Gonez and Nick Melvoin, all voted against renewing the contract, effectively firing Bramlett. On March 16, Rodriguez says that he only had “two glasses of wine” while visiting the Yard House in Pasadena. Still, security felt that the LAUSD Board Member was “displaying aggressive behavior” was “acting loud” and refused “to leave the restaurant.” Police were called and Rodriguez was taken into custody. His conduct during the arrest is available for the public to witness as it was captured by a bodycam attached to one of the officers. What message does the actions of Ref Rodriguez send to the students of the LAUSD? What about his fellow Board members, none of which have called for his resignation? The message is clear; loyalty to political affiliation trumps everything else. You can lie on government forms as long as you are pushing a favorable political agenda. A public servant can be targeted because he might expose wrongdoing by your allies. Public drunkenness and other acts of moral turpitude should be ignored as long as the offender provides a reliable vote. 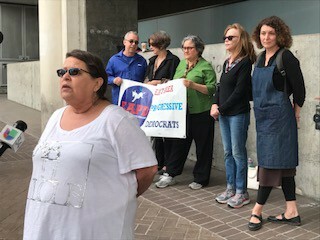 Community members call on Ref Rodriguez to resign. Ref Rodriguez claims that he is working for “our children and community.” In reality, he continues to erode the expectations our children should have of elected officials. This damage is much worse than any good a board member can accomplish. He must resign now!